WOW…takes my breath away. 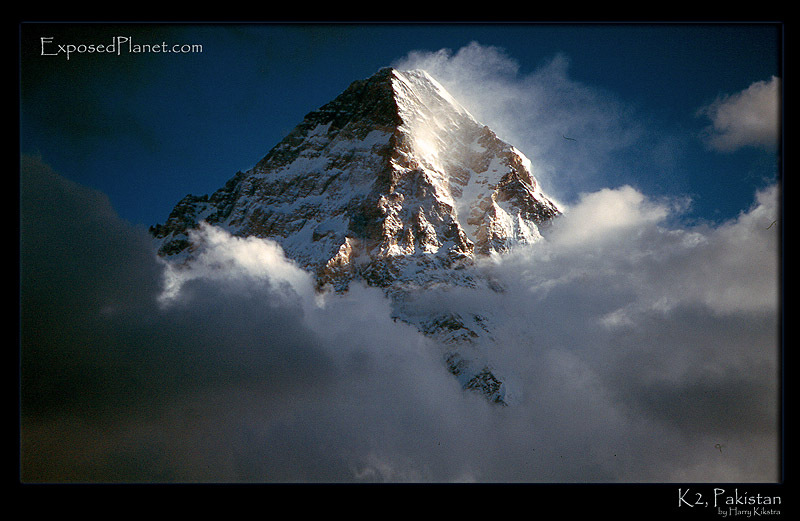 Best photo I have seen of K2. The sense of power is overwhelming! Great shot!!! i hope its ok if i borrow this picture to write a poem on in and put it up on my blog. I will put your name at the bottom of the pic. Its calling me is all i can say when i look at her..i will climb her once…if i die doing it i wont care, i wont blink, i wont curse my fate.. I will get over my cold problems and climb her that is all i have to say. The story behind "Summit of K2 above the clouds"
The mountain is the 2nd highest in the world, after Everest, and is 8611m high (28,251ft). But it is much more difficult and dangerous, even the ‘easiest’ route is not safe from avalanches and is very steep on average and the mountain has taken many lives, including those of famous climbers. Many times in the clouds, it just peaked out for a few moments and I could quickly take this shot of the evening light shining on the summit. Scanned from Provia slide, shot July 2004 with EOS 3.